Along the main coastal road to the North East coast of Corfu is the attractive resort of Dassia. Dassia is a bustling and lively holiday resort with a good selection of places to eat, a wide variety of shops and café bars. The long strip of pebbly beach is backed by a narrow promenade perfect for those evening strolls. For those that enjoy taking part in watersports on their villa holiday, such as waterskiing, banana boats and boat hire, there are 3 watersports jetties along the beach and generally the water is calm. The 2 ends of the beach are more secluded and very pleasant for swimming whilst the central areas are generally livelier with several beachside cafes and tavernas, plus a very popular beach nightclub that serves as a pleasant bar by day and a lively club at night. Dassia is also within easy reach of Corfu town and the beautiful North East Coast, with a good local bus service and a variety of boat trips and excursions on offer. 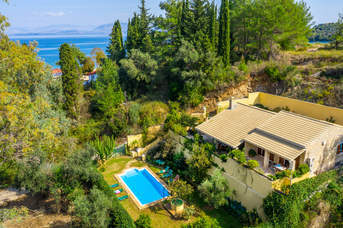 Along the main coastal road to the North East coast of Corfu is the attractive resort of Dassia. Dassia is a bustling and lively holiday resort with a good selection of places to eat, a wide variety of shops and café bars. The long strip of pebbly beach is backed by a narrow promenade perfect for those evening strolls. For those that enjoy taking part in watersports on their villa holiday, such as waterskiing, banana boats and boat hire, there are 3 watersports jetties along the beach and generally the water is calm. The 2 ends of the beach are more secluded and very pleasant for swimming whilst the central areas are generally livelier with several beachside cafes and tavernas, plus a very popular beach nightclub that serves as a pleasant bar by day and a lively club at night. 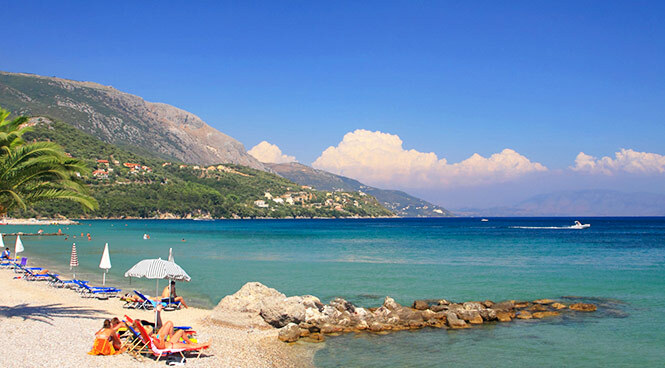 Dassia is also within easy reach of Corfu town and the beautiful North East Coast, with a good local bus service and a variety of boat trips and excursions on offer. The resort of Dassia is around 1 mile long and was one of the first villages on the island to be developed as a holiday resort. It’s a great choice for families, with several tavernas, cafes and shops along the main street, around 10 minutes’ walk from the pleasant long pebbly beach which has clear, shallow water. You can also hire sunbeds and parasols, plus thrill-seekers are well-catered for with various water sport facilities on offer. The resort is also well-positioned for exploring more of what this beautiful Greek island has to offer. The main street leads to Corfu Town in one direction, and the remaining holiday resorts of the North East Coast in the other. Plus, heading 20 minutes inland, you’ll also find the island’s largest waterpark, Aqualand. If you prefer not to drive you can always catch a boat from the seafront and enjoy a daytrip exploring the resorts and hidden beaches further along the coast.